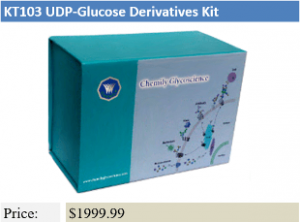 Chemily Glycoscience presents a new, sensitive research tool specifically for investigating glycosphingolipids. Our Glycosphingolipid Glycan Microarray features 58 glycan epitopes representing a variety of glycosphingolipid structures presented on healthy and abnormal cells. 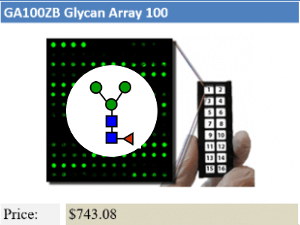 On each array slide are 8 or 16 identical subarrays so that as many samples can be analyzed simultaneously, providing sensitive and high-throughput glycan-binding information for antibodies, cells, or other proteins of interest. 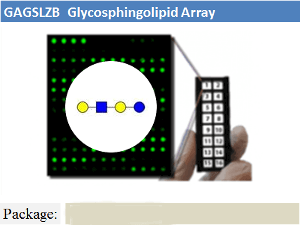 Glycosphingolipid Glycan Microarray on 16 subarray format. A subarray assayed with biotinylated PNA lectin (10 μg/ml), followed by streptavidin-Cy3 (1 μg/ml). 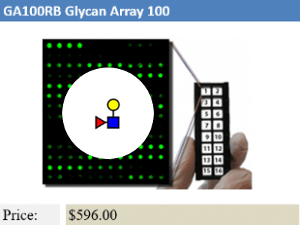 The array was scanned with InnoScan 710 microarray scanner (XDR mode) at 1 PMT and 100% laser power at 532nm wavelength. The positive control 1 shows binding as expected.